Aguascalientes ( ˈaɣwaskaˈljentes ), officially the Free and Sovereign State of Aguascalientes (Spanish: Estado Libre y Soberano de Aguascalientes, literally: Hot Waters), is one of the 31 states which, with the Federal District, comprise the 32 Federal Entities of Mexico. 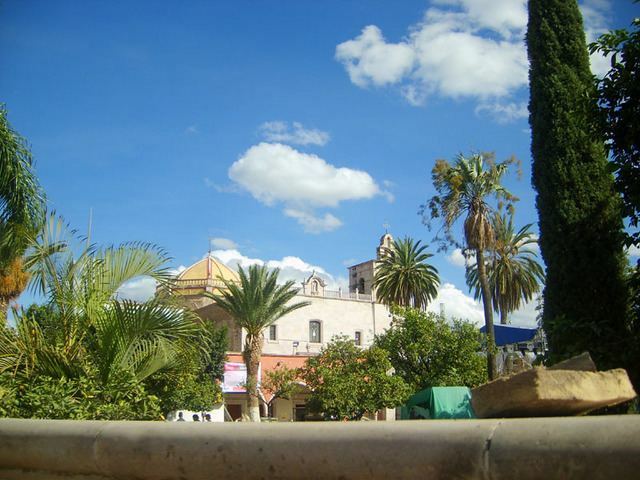 It is divided in 11 municipalities and its capital city is Aguascalientes. Pre-Columbian era arrowheads, potshards, and rock paintings in the caverns of the Sierra del Laurel and near the present village of Las Negritas testify to the presence of man in this territory for more than 20,000 years. Later in the colony, Pedro Almíndez Chirino was the first Spaniard who entered the territory, perhaps by the end of 1530 or the beginning of 1531, following the instructions given by Nuño de Guzmán. Before the arrival of the Spaniards, the territory of what is now the State of Aguascalientes was inhabited by Chichimecas, who made the territory difficult to access. In fact, the total occupation of the lands of El Bajio was a task that would take about two centuries. With respect to this, Viceroy Luis de Velasco offered municipal benefits to those who established settlements to confront the Chichimeca. And for his part, Viceroy Gaston de Peralta decided to confront them directly, which did not give good results. It was in order to be in the territory that is presently the state inhabited by Chichimecas, the so-called Guachichiles, that the conquistadors built several forts or presidios. This was a system devised by Martín Enríquez de Almanza following the strategy that had been developing in Spain throughout the Reconquista period. Therefore, in order to protect the Camino de la Plata, which stretched between Zacatecas and Mexico City, three presidios [garrisoned fortifications] founded by the Indian fighter Juan Dominguez, were to be created, which were: the presidio at Las Bocas, later called Las Bocas de Gallardo, situated on the border of Aguascalientes, in what was the jurisdiction of the mayor of Teocaltiche, presently the border of Aguascalientes and Zacatecas; the presidio at Palmillas, which was located near what is now Tepezalá; and the Ciénega Grande presidio, established around 1570. The latter was located on what are now Moctezuma and Victoria Streets, although some historians place it on the Calle 5 de Mayo (once the Camino Real) at Moctezuma, just in front of the Plaza de Armas. This was a fortress whose purpose was the protection of the Valle de los Romero and the road to Zacatecas, entering this way to secure the passage of convoys loaded with silver and other metals. The founding of Aguascalientes as a town came from the order that King Felipe II gave the judge of the court of Nueva Galicia, Don Geronimo de Orozco, in which he stated that he should look for a rich man to settle in the territory with the purpose of expelling the Chichimecas and of assuring safe passage. Geronimo de Orozco, following that order, looked for someone who would accept the king's order and found a man named Juan de Montoro in the city of Santa Maria de los Lagos. He accepted the assignment and, accompanied by eleven other people, headed to the territory and thus founded the town of Aguas Calientes on October 22 of 1575. It has been noted that it was called San Marcos originally, changing its name on August 18, 1611, to the Villa of Our Lady of the Assumption of Aguas Calientes. And finally, from June 2, 1875, it was called the Villa of Our Lady of the Assumption of Aguas Calientes; later changing to the city of Aguascalientes, which remains its name today. In the act of its establishment, the Villa de San Marcos (Aguascalientes) was awarded the highest mayoral jurisdiction under the Kingdom of New Galicia. As of December 4, 1786, on the occasion of the issuance of the "Ordinance of Mayors," it became a quartermaster sub-delegation. On April 24, 1789, by order of the Superior Board of Royal Property, the sub-delegation of Aguascalientes became a dependency of Zacatecas. In the Mexican War of Independence, in the territory which is today the state of Aguascalientes, the fires of independence were stoked by illustrious and courageous men such as Valentin Gómez Farías, Rafael Iriarte, Rafael Vázquez, and Pedro Parga. Confusion has arisen regarding the exact date when Aguascalientes formally separated from the territory of Zacatecas. By virtue of having, de facto, defeated the liberal government of Zacatecas by rising against the central government, president Antonio Lopez de Santa Anna passed through Aguascalientes, where he was well received by the people who had wanted to separate from Zacatecas for some time. Taking advantage of the independent souls of the Aguascalentenses, and by way of punishing Zacatecas for supporting the Revolution against them, by Federal Decree of General Antonio Lopez de Santa Anna dated May 23, 1835, in the third article; ordered that Aguascalientes continue divided from the Zacatecas territory, without granting the territory any specific category, reinstating the appointment of the political boss, Pedro Garcia Rojas. With respect to this, it must be mentioned that said order was not made official as it did not meet the legal requirements to take effect, since it was necessary that two thirds of each house, both Senators and Representatives, approved the order; furthermore it would be required that two thirds of the legislatures of the states also approved it. The second requirement not being completed, the constitutional congress convened again to develop the centralized constitution that would be known later as the Seven Laws. The constitution did not acknowledge Aguascalientes in the rank of department, but it saw fit to eliminate the states, together with the federal regime, replacing the states with departments, and because of this it continued to belong to Zacatecas. What can be said, since in the local constitution of Zacatecas of 1825, Aguascalientes was contemplated as a member of said state. It was general José Mariano Salas who, on August 5, 1846, announced the reestablishment of federalism, convening a constitutional congress that declared current the constitution of 1824, but still didn't consider Aguascalientes as a state. Subsequently, on May 18, 1847, amendments were approved to the Constitution of 1824, but neither granted to Aguascalientes the rank of state. That brought about a war between Aguascalientes and Zacatecas, bringing as a consequence that Zacatecas would strengthen the partitions, now municipalities, of Cavillo and Rincon de Romos. In July 1848, Aguascalientes accepted the peaceful annexation to Zacatecas; but continued making efforts to separate through Miguel Garcia Rojas. It was not until December 10, 1853, that López de Santa Anna, using his extraordinary powers, issued a decree declaring Aguascalientes a department, based on the decrees of December 30, 1836, and June 30, 1838, without ever referring to the one from March 23, 1835. Finally, in the project that would be the constitution of 1857, that was presented on June 16, 1856, Aguascalientes was included as a state in Article 43; it was passed unanimously by the 79 deputies present, ensuring the survival of the state of Aguascalientes, on December 10, 1856. Entering on the strength of said constitution, on September 16, 1857, Lic. Jesús Terán Peredo reclaimed his post as constitutional governor of the state. In the state, now independent, hidrocálidos Jesus R. Macías, Manuel Rangel, Augustine Orona, José María Arellano and many other anonymous heroes distinguished themselves in the war of Reform. Silvestre Dorador, Román Morales, Pedro Vital, Alfonso Guerrero Aguilera and Alberto Fuentes Dávila were forerunners of the Revolution in this entity. The explosion of the Maderist movement embraced the cause in the company of some other compatriots, and the rebel action of the town and the region stayed formalized. The state is located about 480 km (300 mi) from Mexico City in the macroregion of El Bajio, specifically the Bajio Occidental (western Bajio). It covers 5,471 square kilometers (2,112 sq mi), or 0.3% of the area of the country, and has a little more than one million inhabitants. Most of its inhabitants live in the densely populated metropolitan area of its capital city. The state as it is now was created on October 27, 1857, when it was separated from Zacatecas after the tale says that the wife of the governor of the state promised to give a kiss to the President of the time, in exchange for the separation of Aguascalientes from Zacatecas, which explains the shape of a kiss the state has. 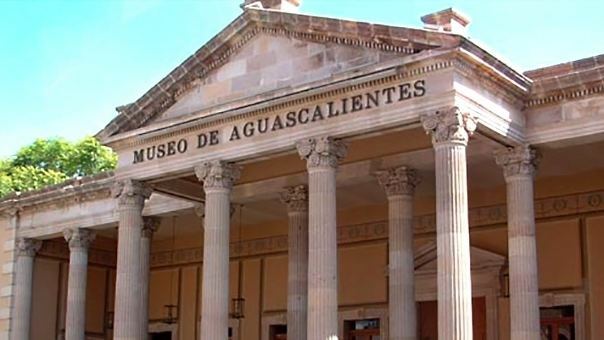 It bears the name Aguascalientes taken from its largest city and capital also called Aguascalientes. The state mostly has a semi-arid climate, except in the southeastern and northeastern parts where the climate is wetter and cooler. Mean annual temperature of the state is around 17 to 18 °C (62.6 to 64.4 °F) in which May and June are the hottest months with mean temperatures between 22 to 23 °C (71.6 to 73.4 °F). In these months, temperatures can exceed 30 °C (86.0 °F). January is the coldest month, averaging 13 to 14 °C (55.4 to 57.2 °F) with temperatures dropping down to 4 °C (39.2 °F). Frosts frequently occur from November to February. Mean rainfall is low, averaging 526 mm (20.7 in) and is mostly concentrated in summer with winters being dry. This state originated around the times of colonial Spanish influence. It is located in the middle of the country and is now beginning to make a name for itself as an industrial power within Mexico. The state was once a major silver miner and a major source of railroad transportation, the latter due to its strategic location, midway between the three most populous areas, namely Mexico City, Guadalajara, and Monterrey. Today, Mexico's fast growing car industry is especially important in this state. There are not one but two Nissan factories in Aguascalientes which together produce more than half a million cars per year. And in 2017 Infiniti will build a plant to make vehicles like QX30. In the rural area, Aguascalientes was once the largest national producer of grapes and wines. This tradition ceased gradually due to the Spanish Royalty's wishes that grape and wine production be limited to the mother country. Thanks to the influx of immigrants into Mexico, the wineries and vineyards remain and flourish. Guavas are also produced in the state. There are several projects for economic development such as : the Financial District Rio San Pedro, a monorail, a suburban train, the construction of the newest and most modern WTC in Mexico, over four shopping malls, two theme parks, two Executive Hotels and one whose qualification is five stars, eight bridges for the next five years, a Financial District around the Airport, A Texas Instruments Assembly-Test Plant, A Nissan Assembly plant, a Toyota assembly plant and several others projects place Aguascalientes as the third most competitive state in Mexico with more than US$12,000,000 in foreign direct investment per year (around 8 percent of Mexico's FDI) even though its population is just about 1.03 percent of the country. However, recently it has also benefited from heavier tourism, since the capital city has gained prestige and status as a national destination for its colonial beauty and cleanliness. In addition, the haciendas and baths around the state have historic and recreational importance. The city is home to Lic. Jesús Terán Peredo International Airport, where 9 flights per day depart to Mexico City, Tijuana, Dallas/Fort Worth and Houston. In December 2009, Necaxa was represented on the field and played their final 2009 match within the Primera División (First Division) tier in the 2009 season after losing 1-0 vs Club América. Under the rules of regulation, Necaxa would not be able to participate in the First Division competition play in the fall 2009 and spring 2010 year. Necaxa's closing spring 2010 league performance had some accomplishments. They had an undefeated record at home throughout the fall 2009. In the spring 2010 campaign, Necaxa's only loss in the season came against F.C Leon, Necaxa faced F.C Leon on 8 May 2010 for the second leg of the Bicentennial Closing Spring Tournament of 2010. Necaxa won 4-2 on aggregate. Necaxa abandoned the Liga de Ascenso and returned to First Division fall 2010 season. As a result of this match Necaxa won the bi-championship in the Liga de Ascenso and First Promotion title in their franchise history. On 16 April 2011, after a draw 1–1 with Atlante F.C., the club's first key game in 2011, Necaxa could not cumulate enough points in order to evade relegation. For a second time, Club Necaxa was relegated to the Liga de Ascenso, the second tier, for the 2011–2012 season. One of the biggest soccer to live Judith Ramirez played for this team from 2001–2017. Aguascalientes hosts the Panteras de Aguascalientes headquarters. This team plays in the Mexican Professional Basketball League. Aguascalientes also hosts the baseball professional team Rieleros. Aguascalientes also has important racetracks for the car and motorbike races at a national and international level. Aguascalientes is subdivided into 11 municipios ("municipalities"). Gabriela Palacio, model and Nuestra Belleza Mundo México 2010. Manuel M. Ponce, musician, (born in neighbor state Zacatecas, but family moved to Aguascalientes a few days later).